Known for its wound healing abilities. Also known as Labdanum. Cistus essential oil shows antimicrobial properties against Staph, E. Coli and Candida. 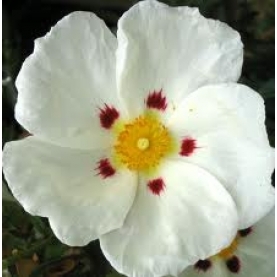 Cistus is known for its wound healing abilities. Effective for chronic conditions like psoriasis & eczema. Cistus acts fast to stop the bleeding from a fresh wound. It increases lymph drainage, is beneficial for acne & oily skin, as well as wrinkles & mature skin. Can be used for coughs, colds & bronchitis as well. A small, wild growing shrub, Cistus has lanced shaped leaves that are white & woolly beneath and sticky on top, with fragrant white flowers. Can grow up to 3 meters high. The Egyptians, after importing Cistus from Crete, used the resin as a perfume & incense. It is said that in Christ’s time, an incense was made with Myrrh, Frankincense & “Onycha”, later identified as gum labdanum, which is extracted from the leaves of Cistus. It has been used since the Middle Ages in Europe to treat wounds & ulcers of the skin. The gum was used for diarrhea, dysentery, & catarrh. It has also been used as a fixative for perfumery. Cistus is believed to help alleviate shock from traumatic events, and soothes the heart after a crisis, especially when someone is feeling cold, empty & numb. It’s beneficial for meditation, as it has centering qualities that help one to visualize, and to bring those vision to light. Woodward suggests using Cistus with those who experience a disconnection from their spiritual self & being in fear. Helps to connect to the spirit realms with ease. Skin sensitization can occur if the oil is oxidized.